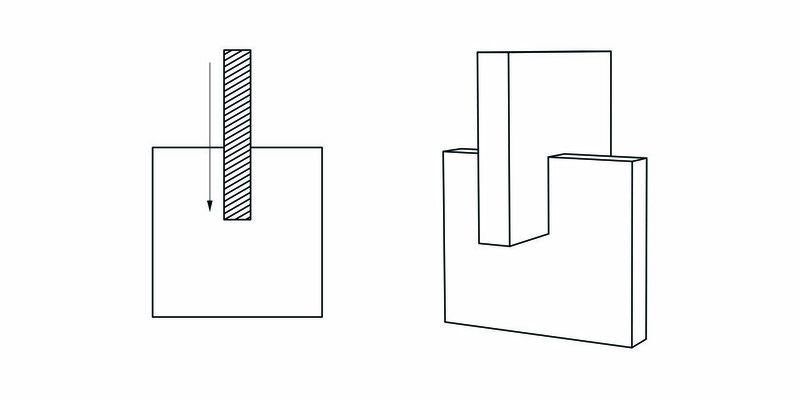 Blog — CNC Cutting Inc.
One design consideration that comes up or is missing time and time again is the removal of the radius to internal corners left by our cutting tools so that a tight fit is achieved and the parts end up in the location required. What you want; the part to slide into the slot and hit the back of the slot so that it is in exactly the place you designed it to be. This radius is dependent on the size of the tool doing the cutting. This will either be determined by the type of material, the detail required or what is affordable. Most commonly for 18mm or 3/4" sheet materials like plywood we use a 1/2" diameter tool so this radius left behind is a 1/4". This will mean that a collision between you part slotting in and the residual material will occur. The answer is the 'dog bone'. In our social media discussions with clients and other makers we've also heard these referred to as 'panda ears', 'bubbles' and other weird and wonderful lingo. There are a few options and each has their own pros and cons. Each type has the cutting tool extending into the part a little bit to remove the material in question. The type shown on the left is our most commonly used because if the part sliding in has a slot itself, these areas of extra removed material is hidden. If the material is 3/4" thick however a tool as small as 1/4" in diameter will need to be used for there to be material left in the middle for the part to collide with and lock into it's intended position. This size tool will increase cutting time and cost. The type shown in the middle creates the smallest area of removed material left visible after a part slotted into this position. Again, for a 3/4" material a 3/8" diameter tool is the largest we could use and there would be an increase in machining time. The type shown on the right is the most time/cost efficient method as it uses the same size tool as we'd typically use anyway. We use this type when seeing this detail is not important or it's in a location that isn't seen anyway. Vectors should be supplied with this extension taken into account. The shape on the left shows a shape without this taken into account. We will then select the tool you've allowed for when we program the CNC machine. The red area shows the path the tool will take based on the supplied geometry. The resultant shape after the tool goes around the supplied vectors. With tooling radius taken into account in the design and documentation, the part goes where it's supposed to during assembly. 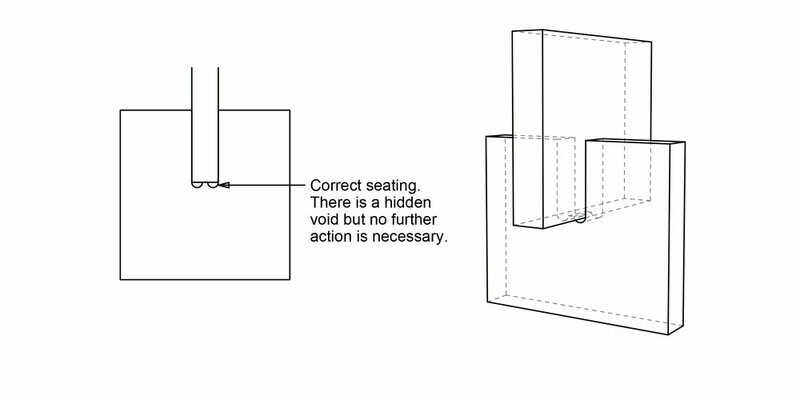 As previously alluded to, the dogbones can have no noticable impact on your design if used correctly.